Bandon Dunes in Oregon has five courses, including the No. 1 rated course in the United States, Pacific Dunes, as seen here from the 11th hole. Bandon Dunes. Pinehurst. Pebble Beach. Kiawah Island. Casa de Campo. For golfers, those names, some new, some old, aren’t just places, but the links versions of Mecca. They are destinations in the United States, Mexico and the Caribbean that epitomize what today can only be dubbed a “New Golden Age” for golf, one that combines golf resorts and travel. While very few new golf resort projects have been undertaken recently—there have actually been more golf course closings than openings in recent years—those few have tended to be excellent, as only the best can draw enough golfers to make economic sense today. At the same time, amidst stiff competition, many existing and classic golf resorts have expanded, adding courses, or making dramatic improvements—sometimes, spending millions, even hundreds of millions of dollars. In a very real sense, there has never been a better time for a golf vacation. The big question is where to go? We’ve answered that by polling a panel of experts, who have rated the 25 Best Golf Resorts in the United States and the 10 Best in the Caribbean and Mexico. They’ve also tackled quandaries such as which resort has the best spa, cuisine, luxury accommodations, is best for families, and so on. For over a decade, our uniquely critical travel surveys have taken a much different tact than the travel magazines’ standard reader polls, which can be easily influenced by the hotels and resorts themselves, along with advertisers, while relying primarily on unvetted participants who may or may not have actually been to the places they vote for. In sharp contrast, we have assembled a dream team of bona fide experts in the field, featuring some of the world’s best luxury travel agents, golf tour companies, golf journalists and editors, avid golf travelers and industry insiders. That we are living in a Golden Age of golf travel is evidenced by the fact that an entirely new resort, Florida’s Streamsong, opened just last December, cracked the list as the eleventh best in the nation. Likewise, the ultra-luxury Ritz-Carlton Reserve at Dorado Beach, Puerto Rico, the first of Ritz’ top-tier Reserve brand in North America, which also opened last year, made the Caribbean top 10, while Puerto Rica’s Royal Isabela, also new last year, barely missed the cut—and only because not enough people have seen it yet. The top-rated resort in the United States, Bandon Dunes opened in 1999, but its two newest courses debuted last year and in 2010, making it a true weeklong destination resort. Second-place winner Pinehurst undertook an exhaustive and critically acclaimed renovation of its marquee Number Two course, designed originally by Donald Ross, last year that immediately catapulted its ranking, while sixth-place finisher Sea Island has built two entirely new hotels in the past decade, both rated the highest possible Forbes Five-Stars (formerly Mobil). It seems in the world of upscale golf travel that if a resort is not moving forward it is losing ground. Several panelists specifically cited the recent overhaul of both hotel and golf at Hawaii’s Princeville as the reason they ranked it as high as they did. Perhaps the biggest stunner of all was Southern California’s amazing Grand Del Mar. Only six years old, the resort is a triple Forbes 5-Star winner for lodging, dining and spa, and it crushed the competition, winning for Best Single Course Golf Resort and Best Dining at a Golf Resort, while also making the podium in the spa and luxury lodging categories. For purposes of this poll, we defined a golf resort as those that had lodging, hotel services and golf under one roof, nixing hotels that have some sort of access to an off-site course or courses with associated lodging someplace else, which eliminated places like Las Vegas’ excellent Shadow Creek, a longtime favorite of our panelists. Not surprisingly, resorts with multiple courses fared best, since they are best suited for longer destination golf trips, and seven of the 10 Caribbean and Mexico winners have more than 18 holes, while the top five U.S. finishers each have at least four courses. Notably, these five also all feature caddies and walking to varying degrees, something our voters noted over and over as a big plus. But quantity does not mean quality, as all five of these also have at least one marquee course widely rated in the nation’s top 10, while several notable resorts with three, four or even five courses failed to make our cut. Many such resorts with multiple mediocre courses were beaten by properties with a single top-flight 18-hole course. If there was one trend we saw clearly in the voting, it is that the boutique golf resort, with as little as one course and a dozen luxury rooms (or villas! ), plus white-glove service and excellent cuisine, is on the rise. This was evidenced by the wins of places like the Grand Del Mar, Mauna Kea Beach Resort, Mayakoba, the Abaco Club, Wynn Las Vegas and strong showings by CordeValle, the Four Seasons Nevis, Virginia’s Primland, and Caribbean newcomers Royal Isabela and CuisinArt Golf Resort & Spa. Our panelists cast votes far and wide, from Nebraska to Nicaragua, but they reached near consensus on a couple of things. Oregon’s Bandon Dunes was not just the No. 1 resort, it received nothing worse than a second-place vote, while second- and third-place finishers Pinehurst and Pebble Beach each had almost exclusively top three rankings on the ballots cast. Likewise, Casa de Campo ran away with the top spot in the Caribbean and Mexico by a wide margin. If reading this makes you want to take a golf vacation, our panel of experts knows just where you should go. Not exactly a surprise, this larger-than-life links golf throwback on the Oregon coast has three of the Top 10 public courses in the United States on Golf Magazine’s current list—including No. 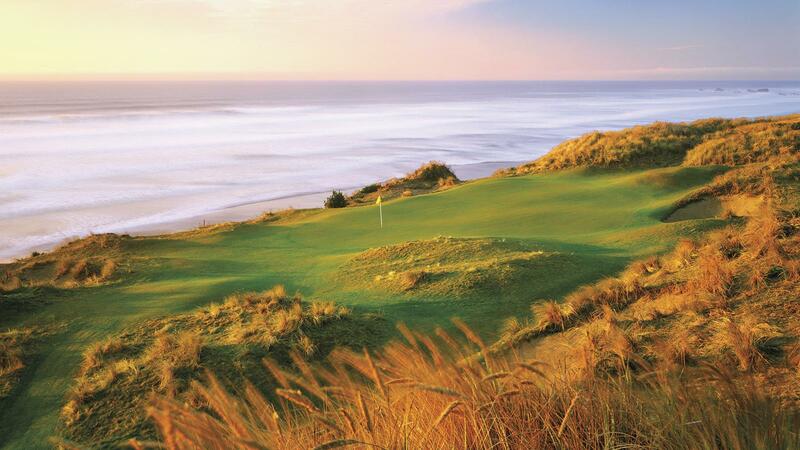 1, Pacific Dunes. Its “worst” eighteen and fourth full-sized layout is ranked 15th in the nation, and it also has a fantastic par-3 course. However, Bandon Dunes is not for everyone—all the courses are walking only, no carts, the weather can be raw, and the focus is firmly on golf, not luxury lodging, amenities or cuisine, though the simple approach to dining is still delicious. For the golf purist it is impossible to beat, but those seeking Michelin-starred meals, swank suites or a slate of activities for non-golfing companions might look elsewhere. A bit of a surprise to edge out famed Pebble Beach, Pinehurst actually had more ballots cast for it than any resort. Many experts cited the dramatic post-renovation improvements to legendary course No. 2—already a consensus U.S. top 10. The only public course to ever host two different Major tournaments and the Ryder Cup, it is among the nation’s most historical venues, America’s answer to St Andrews Old Course. But No. 2 is just one of eight 18-hole layouts comprising America’s largest—and first—golf resort. This history swayed many of our voters, but so did the Southern hospitality and countless amenities, from a huge spa to world class tennis and croquet facilities. The highest ranked course ever designed by legend Pete Dye, The Ocean Course is a PGA Championship and Ryder Cup venue that anchors five courses by the likes of Nicklaus, Fazio and Player. This expansive resort occupies so much of the beautiful Low Country island that each course has its own clubhouse, but the resort centerpiece is the Forbes Five-Star Sanctuary hotel, consistently rated among the best in all of golf. “The Five-Star, Five-Diamond Sanctuary sits on 10 miles of private beach, with Southern food and Southern hospitality that will get you to whichever of the five courses you want to play. This is my favorite East Coast golf resort,” says Anne Scully, a superstar travel agent routinely ranked one of the 10 best in the business. “The Ocean Course is a clinic in golf course design because it plays so dramatically differently from every set of tees —it can be great fun or the toughest round you’ll ever face,” says Olmsted. “When your choice of lodging is between the St. Regis and the Four Seasons you know you’ve arrived somewhere great,” says TheAPosition.com’s Jeff Wallach. “Add two Nicklaus golf courses and a remote and secluded tropical location, and Punta Mita rises high in the Caribbean rota.” It is also home to the world’s only natural island green, an offshore atoll that Nicklaus could not resist and turned into a par-3 from the beach, “The Tail of the Whale.” Depending on tide, you can walk out on a sandbar or be shuttled in an amphibious cart to putt out—it is one of the most memorable and dramatic holes on earth. “Loved by families and couples alike, Punta Mita is a perennial Golf Odyssey subscriber favorite,” says Baum who explains why. Maybe the fact that its owner, Kohler Co., makes the equipment many other top spas use gave it an unfair edge, but our panelists didn’t care. “The best spa without a doubt is at the American Club. Fantastic attention to detail in one of the most impressive hotels in America,” says Quentin F.J. Lutz, believed to have been the youngest person ever to play the Top 100 Golf Courses of the World and founder of The Outpost Club, the first invitation-only golf society in the U.S.. “You’ll revel in marble floors, out-of-this world showers, hot tubs with mosaic tiles, and an indoor pool with its own waterfall. This gorgeous therapeutic and pampering sanctuary features a glass-enclosed rooftop deck and incredible whirlpool, steam and sauna rooms. So many times showy facilities trump actual therapies—not so here—services are first-rate,” says Golf Odyssey’s David Baum. “Inspired by the design principles of Italian Renaissance architect Andrea Palladio, Pelican Hill transports guests to a Mediterranean-style village. The resort pool—the largest circular pool in the world—enjoys a coliseum setting, and the water is impossibly blue thanks to a million iridescent glass mosaic tiles on the pool bottom. Guest bungalows and villas are terraced into a hillside overlooking the ocean. One-bedroom bungalows start at 847 square feet and instead of packets of coffee, your bungalow comes with a coffee grinder and beans. If you’re staying in a villa, you can have your butler do the grinding for you. No other golf sanctuary surpasses Pelican Hill’s combination of aesthetic beauty, comfort, opulence and dedicated service.” Many panelists agreed and several mentioned the coffee, but none said it more eloquently than Golf Odyssey’s David Baum. Now owned by software billionaire Larry Ellison, these twin resorts each have a (stunning) golf course and full resort amenities, but since they share everything between all guests, with shuttles back and forth, they are essentially one resort—that happens to occupy a nearly private island paradise. There are secluded beaches access by four-wheel drive, gorgeous hikes, a marine sanctuary for snorkeling and swimming, whale watching cruises, spas, and most of all, secluded and very private relaxation. “The place to stay if you want to feel like Bill Gates (who rented the entire island for his wedding here) and golf and stroll among quiet luxury of the highest order,” says Jeff Wallach. To say our panelists loved this resort is an understatement, and with wins for food, spa and lodging it was almost inevitable it would take this category—even if golf might be the least impressive feature of the resort. It is a solid and quite private Tom Fazio layout, but it gets overshadowed because everything else here is that good, and. “Fazio’s gem nestled in the Los Peñasquitos Canyon Preserve features dramatic holes with a variety of elevation changes. My clients love everything about this place—the spacious rooms, the golf, pool, the beautiful equestrian center and the FOOD!” says travel agent Chad Clark. “Facilities, from the spa to the tennis complex to the equestrian center, are first-rate,” agreed David Baum.